Sass was introduced about 7 years ago as a workaround for CSS flaws and has come a long way since then. It has played a major role in popularizing CSS preprocessing, to the point where the question is no longer if you should use a preprocessor, but which one you should use. It turns out, the answer to that question is very often Sass — because the syntax is better (and closer to CSS), because it’s permissive, and because it can do a lot of stuff and works well. Since being introduced, Sass has become arguably the most important CSS preprocessor available today. It has a whole ecosystem growing around it (starting with Compass) — Playgrounds, applications, grid systems, libraries, and so on… But it’s not always that easy to dig up interesting stuff about Sass. The more there is, the more you have to look in order to find the thing you want. Hence this blog post. What if I tried to enlighten the path by showing you what I think are the most valuable Sass tools? Sounds cool right? Let’s go. CodePen, by Chris Coyier, Alex Vasquez, and Tim Sabat, is by far the best playground you can use. 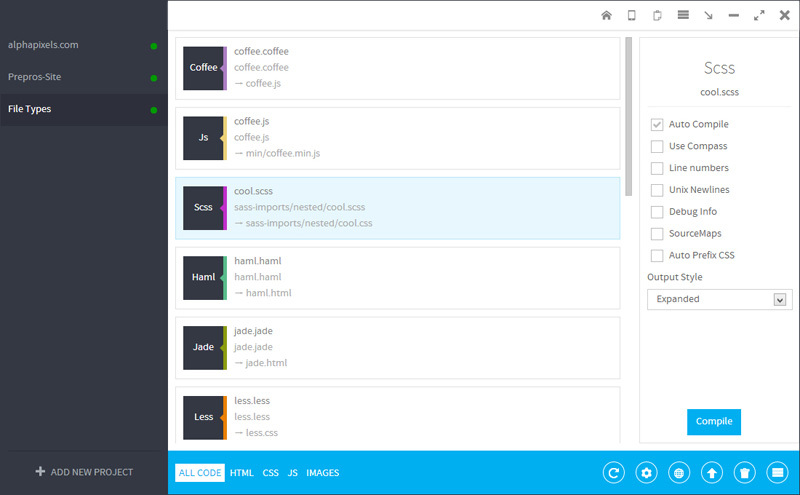 It offers everything you need and beyond for front-end testing. Regarding Sass, it supports the stable version (version 3.3.4 as of writing) and you can use either the old indented syntax or the SCSS one. You can also pick between Compass and Bourbon (or none). It also shows you syntax errors. It’s really awesome so if you don’t know about it yet, have a tour and give the Sass features a try. SassMeister, by Jed Foster, is a playground that specializes only in Sass-related stuff. Obviously then, it does the job better than CodePen. You can use either stable, or Sass 3.2.14, or even LibSass, the C port of Sass (still running on Sass 3.1.x as of this writing). Of course, SassMeister lets you choose the syntax you feel more comfortable with and you even can choose the output style (expanded, compressed, and so on). Most importantly, because SassMeister is specific to Sass, it allows you to import Sass libraries (Compass extensions actually). You can even propose your own extensions if you think they should be added. Note: there are also CSSDeck, JSBin, JSFiddle and some other playgrounds that offer preprocessor options, but they do not compare with CodePen and SassMeister when it comes to Sass. Okay, code playgrounds are pretty cool when you want to experiment with Sass but when it comes to using Sass in an actual project, you’re on your own. You can’t defer the compilation to the playground or something. You have to do it by yourself — unless you decide to use a tool. There are quite a few apps for this but I feel two of them really stand out. Prepros is a fairly new piece of software aimed at easing the pain of dealing with preprocessing compilation, especially when it comes to command line (ooooohh, the command line!). It provides a neat user interface that lets you compile your sources seamlessly, without having to type a single command. I tried at launch and it was really cool so I think it’s a rock solid option. CodeKit, on the other hand, is not brand new but has been freshened up upon moving to v2.0. I’ve heard nothing but the best about CodeKit in the past so I can only assume CodeKit v2.0 is great. However I can see two downsides to CodeKit: First is the fact that it’s only available to Mac users, and it’s not free. If you don’t want to pay anything or are not using a Mac, go for Prepros. If you have a Mac and can spare the ~$25, then it depends. I’d say CodeKit has a better track record so far while Prepros is still fairly new. Note: There are other options like Compass.app, Scout (which I wouldn’t recommand due to some bugs and the fact that it no longer seems to be supported). But none of the alternatives compare with CodeKit and Prepros. There are hundreds of CSS grid systems to choose from. Many are built on top of a CSS preprocessor, most of which are using Sass. So when you have to pick an existing, solid, and powerful grid system based on Sass for a project, it can be complicated. How can you know which one is good and which one is not? Or which one deals with responsiveness nicely, and which one is easy enough to get started? If you ask me, there are 2 grid systems written in Sass that really are above average. 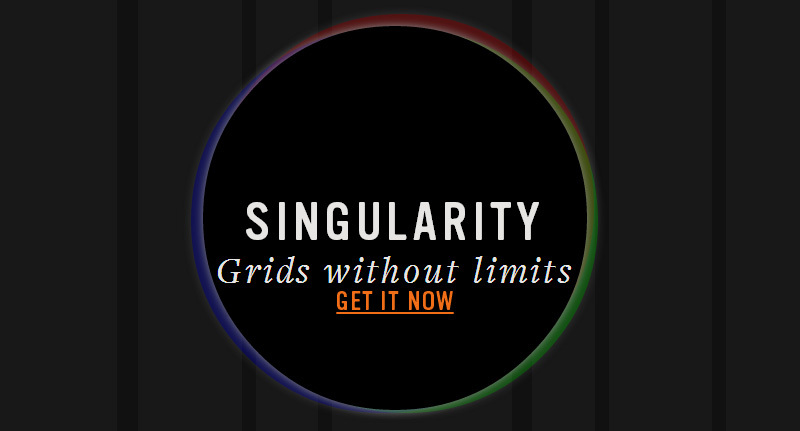 Singularity.gs, by Scott Kellum and Sam Richard, is not your average grid system. It provides a powerful API allowing you to create pretty much any kind of grid you want, controlling the number of columns, the gutter widths, aspect ratio, and lots more. Singularity comes with a whole wiki to get you started. Susy, by Eric M. Suzanne, just moved to version 2.0, making it a masterpiece of Sass code and helping you to deploy the wickedest grids. Susy has to be one of the most interesting Sass projects I’ve ever seen and offers a complete documentation to learn how to use it. Both options are top-notch grid systems doing more than you’ll ever need to do, so feel free to pick one or the other. That being said, because Susy doesn’t depend on Compass, it makes it the perfect choice for projects running without Compass (e.g. projects powered by LibSass). Also, if you’re interested in reading Sass poetry, be sure to look at Susy’s source code! Note: during early months of 2013, both grid systems were supposed to be merged into what would be called Susy Next. It is no longer the case and both projects still co-exist. Whether you are setting up a robust Sass architecture or writing a cool little library, there comes a time when you might want to test your code. While CSS is not something we are accustomed to testing, there are clever minds that have provided some smart tools to help test Sass code. True, by Eric M. Suzanne, is a TDD-style framework for Sass, inspired by QUnit. It helps you in writing tests for your functions. I haven’t tried it myself but I’ve heard nothing but great things about it. For instance, it is the testing framework used for Susy, which we just discussed; also Compass plans on using True for its own tests. 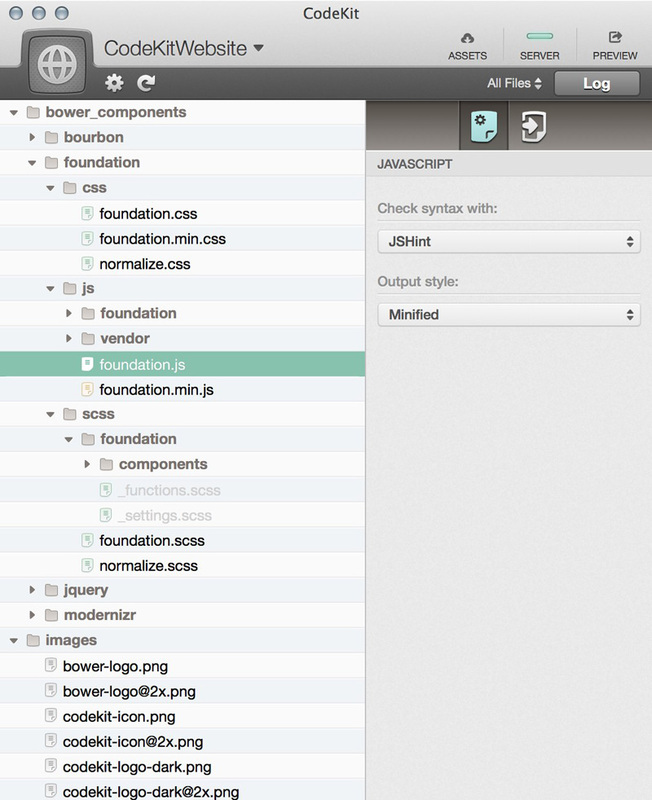 As you can see, these two frameworks look similar. I like the fact that Bootcamp runs on Grunt and NPM with a very simple syntax. On the other hand, True has proven to work very well on Susy and is very lightweight. On a side note, Bootcamp 2 is in the pipeline and is going to make the syntax a whole simpler. There are countless Sass libraries (most as Compass extensions). Since Sache.in was created, it has never been easier to discover new extensions. Basically, Sache.in is a plugin finder for Sass. You can look for a specific library, or tags, or simply browse through the best Sass extensions. Modernizr Helper Mixin, by Daniel Guillan, is a very lightweight Compass extension that provides an extra simple API for Modernizr integration. Basically, it makes obvious what you are trying to do when you use Modernizr’s .no-* classes in your stylesheets. Quotation Marks, by Nico Hagenburger, is kind of a weird one — I like it very much. This micro-library helps you use accurate quotation marks depending on the language you’re using. It currently supports over 55 different languages and is easily extensible for more. Animate.sass, by Polikin, is the honorable successor of Animate.css, a collection of plug-and-play CSS animations to enhance your interfaces. It doesn’t do much more than rewrite the original library by taking advantage of Sass features like loops, mixins, variables and such. HiDPI is a very valuable Compass extension written by Kaelig from The Guardian, seamlessly serving high-resolution background images to high-density (Retina) displays. Given how hard it is to deal with Retina displays, such a tool is a blessing. SassyJSON started as a fun project between Fabrice Weinberg and I, until we ended up with a JSON parser written in Sass. Basically, SassyJSON provides a simple API to encode and decode Sass within Sass. What is cool about SassyJSON is that it preserves Sass data types when decoding JSON. This means if you have a JSON string containing "#444444", it will be returned as a color in Sass. Same with a number, a length, an angle, or whatever. So you can definitely get JSON data, decode the data in Sass, and use them seamlessly in your stylesheet. That’s pretty much it, folks! I think this is a decent round-up of Sass tools. If you have any more interesting Sass tools and resources to share, be sure to drop a comment!